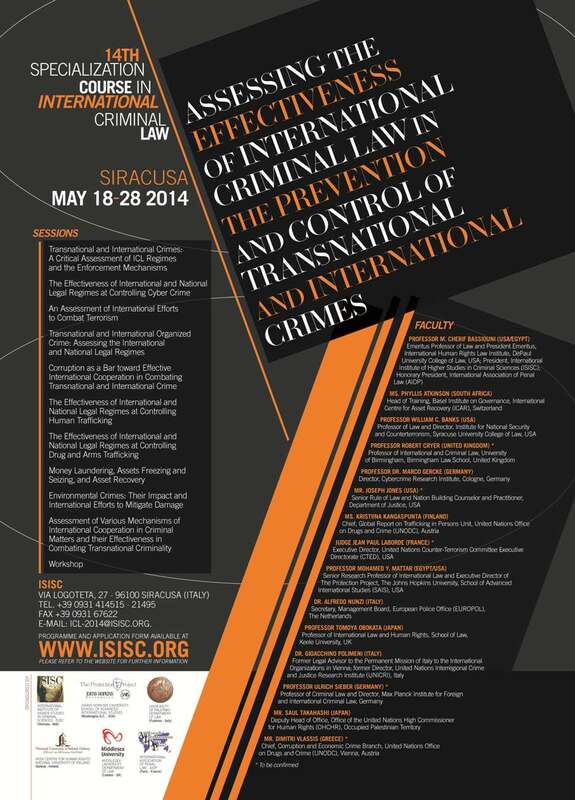 We are glad to announce ISISC’s 14th Specialization Course in International Criminal Law for Young Penalists on “Assessing the Effectiveness of International Criminal Law in the Prevention and Control of Transnational and International Crimes”. The course will take place from May 18th to May 28th and is open to all international graduate law students. The deadline for application submissions is March 20th, 2014. ISISC will select 60 participants who should have at a minimum a first degree in law, having graduated in the last eight years (between 2006 – 2014), and be 35 years of age or under. Furthermore, the Institute will offer 10 scholarships to applicants from Developing and Less Developed Countries. All relevant information and the application form are available on our website (www.isisc.org). Please do not hesitate to contact ISISC for any questions or concerns you may have at [email protected].